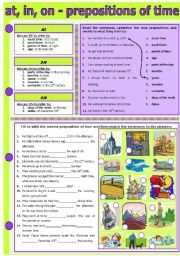 A basic presentation on the uses of AT, IN, ON as prepositions of place, followed by two simple activities: identify the prepositions of time and their meaning (based on the presentation) and a fill in and matching activity. I hope you find it useful! ENJOY !!! A basic presentation on the uses of AT, IN, ON as prepositions of time, followed by two simple activities: identify the prepositions of time and their meaning (based on the presentation) and a fill in and matching activity. 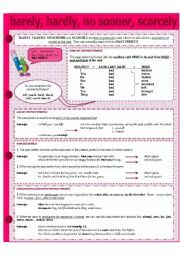 I hope you find it useful! ENJOY !!! 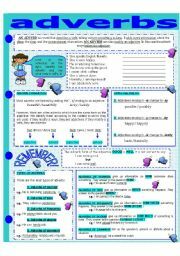 This is a follow-up activity for the two worksheets I already sent on AT, IN, ON as PREPOSITIONS OF TIME and PREPOSITIONS OF PLACE. I hope you will find this one as useful as the previous ones. ENJOY !!! 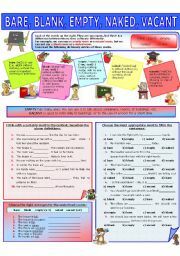 This is the first worksheet in a series about COLLOCATION. I am going to number each one individually, since I already have prepared 10 of them, but probably I will prepare a few more. This one is about BARE, BLANK, EMPTY, NAKED, VACANT. The dictionary entries are taken from The Oxford Dictionary. ENJOY !!! The tenth in the series: COLLOCATION - SAY, TELL, SPEAK, TALK.Unfortunately, this is the only one I send today. 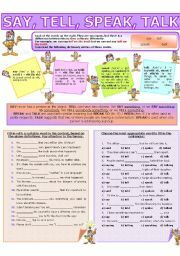 My little girl has a minor cold, and she was moody all day long, so I didn�t have the time to finish the other worksheets on COLLOCATION. But don�t worry ... they are coming ....And there are quite a few more ... ENJOY!!! The 11th in the series of COLLOCATION. This one is about ACCIDENT, EVENT, HAPPENING, INCIDENT and OCCURRENCE. 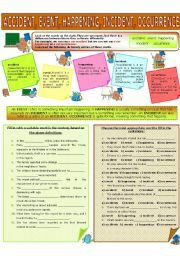 Hope you will find this one as useful as the previous ones ... ENJOY!!! 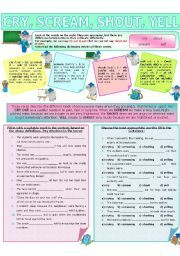 I managed to finish one more worksheet on COLLOCATION. This is the 12th, but so far I have reached 21 worksheets on COLLOCATION. So there are a few more to come ... This one is about CRY, SCREAM, SHOUT and YELL. ENJOY !! !